With very little happening in the F1 world at the moment, I thought it would be a good chance to have a look at what it is really all about. You might think that the drivers and teams compete for honor, glory and prestige but there is more to it than that. The cynical could suggest that it is all about money really, better marketing for the constructor, more millions for the driver. And the purist would say that it's about the need to be the best. But no, it's really a fight for another trophy, one to put above all those you won for each race. 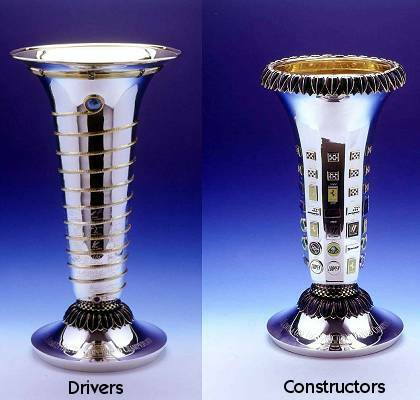 And here they are, the drivers and constructors championship trophies, the awards that everyone would like to get their hands on. Those are two pretty big mugs. The driver's one has the names of all the previous champions engraved in a spiral starting from the bottom; the contructors champs have their badges stuck on in strategic positions - look closely and you can see the Ferrari, Lotus and Cooper emblems. We don't often see the trophies - in fact they are rarely mentioned. But they are the most sought after trophies in the F1 world. At the end of the year, the FIA stages a big presentation to which all the great and good are invited, everyone wears their best gear and the trophies are handed out to the winners. It's a pretty big deal and a time for smiles and speeches all round. I think that's the first time I've ever seen the trophies - certainly if I have seen them before then I don't remember it! One of the highlights of the football season is that when, for example, Manchester United finally clinch the Premiership then they are presented with the trophy there are then - or at their next home game or at the final game of the season or whatever. The point being they are presented with it in front of the fans who have supported them to victory over the season. Why the FIA don't present the winners with the relevant trophy as and when it's appropriate at an actual grand prix weekend I'll never know. The only reason I know the trophies exist is because I stumbled upon the photos when I was doing some searching on the FIA website a few months ago. And that's after over forty years of following the sport. How much Cristal champagne can those things hold? LOL! I think you'd have to ask Fernando Alonso that one, Neil - he would be the last to have held the thing! You'd have a bit of a job drinking from it though, with those wide rims. Get most of it in your face, I think.